We've all been part of a Secret Santa where we didn't know what to get. White Elephants are fun, but buying gifts for an unknown recipient seems wasteful. Here enters Team Lighting's GREEN ELEPHANT. 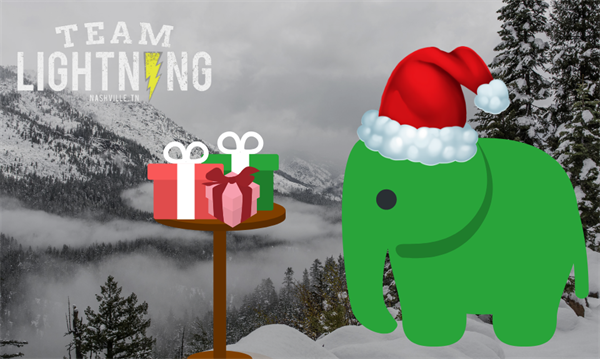 All the fun and excitement of a White Elephant gift exchange without the environmental footprint. Feel free to wear your wackiest Christmas sweaters, onesies, or other holiday attire as we experience a night of green living and responsible giving! Let the gift exchange begin! For complete white (GREEN!) elephant rules, please see below. Price: Free to attend! Please keep value of newly purchased gifts under $30. Regifted presents are welcome too! Pets: No pets allowed at this event with exceptions made for service animals. Registration: Please register above so we can get an accurate headcount. Each player brings one wrapped gift to contribute to a common pool. The first player selects a gift from the pool and opens it. They will later have a change to steal a gift at the end of the game if they want. The following players can choose to either pick an unwrapped gift from the pool or steal a previous player’s gift. Anyone who gets their gift stolen in this way can do the same – choose a new gift or steal from someone else.There is a maximum of 3 consecutive steals per turn. If there are 3 consecutive steals, the next player must choose a new gift. Need suggestions on what to bring? Check out this helpful guide by our interns!